Corel® Painter™ 12 is the world\’s leading digital art software. Its combination of inventive drawing tools, Natural-Media® brushes, image cloning capabilities and virtually unlimited customization options give you total freedom for creative expression. Internationally recognized for its RealBristle™ brushes, Painter offers the most realistic form of digital painting available in the digital art realm. And with the introduction of new Real Watercolor and Real Wet Oil brushes, plus exciting creative features exclusive to this version, Painter continues to change what\’s possible in art! Designed for artists by artists, Corel® Painter™ 12 opens up a world of creativity. With an impressive array of brushes, paper textures, paints, oils, watercolors and more, if you can dream it, you can create it in Painter! Thanks to extensive file support, you can also build upon projects you\’ve started in other programs, making Painter a great complement to Adobe® Photoshop®. This latest version of the world\’s leading digital art software helps artists evolve their creative possibilities more than ever—see it for yourself! Create electrifying kaleidoscope effects on canvas with this exciting new tool that only exists in Painter 12! Use your choice of media to paint transfixing patterns and colors, using three to 12 mirrored planes. No other digital painting software in the world can produce such a \’wow\’ reaction! Save time as you paint with perfect precision! This new tool copies every stroke you make onto the opposite side of your canvas. You choose whether it\’s mirrored horizontally, vertically or both. It\’s double the fun in half the time! Reproduce the movement and feeling of traditional art on canvas! Painter\’s RealBristle™ brushes represent a major milestone for digital painting, providing the most realistic painting experience when paired with a graphics tablet. Designed to work with a Wacom® pen tablet, Painter\’s RealBristle Dry Media tools, such as Chalk, Marker, Pen and Pencil media, let you control opacity, color intensity, ink and shading simply by adjusting the pressure, angle and speed of your pen on tablet. Achieve the most authentic results! This breakthrough tool blends and dries more realistically than any other watercolor brush. Control wind direction for drying, and watch colors interact with the paper grain and change pigmentation in the most lifelike way. Also customize your paper texture settings to influence how the watercolor paint flows and pools on the canvas. All of the fun, none of the mess or smell! With 12 new tools, the Real Wet Oil category offers the perfect solution for blending and painting flowing colors. Add solvents to the canvas for even more control. This new brush category gives artists that heightened sense of realism that only Painter 12 can deliver. Save time when working with photos. You can now create and manage numerous images for cloning within a single Painter file, using the new Clone Source palette. Simply create a library of objects that can easily be cloned and inserted into a painting. Transform photos into paintings by hand or let the Auto-Painting palette paint a photo for you, using your choice of brush and media. Painter contains sophisticated SmartStroke™ brush technology that follows the lines and contours in a picture just like a real artist would. Give your art a level of texture and detail that no other digital painting software or photo-painting tools can produce. Choose paper textures for your canvas or create and customize your own texaftures to produce really unique artwork. The new Real Wet Oil and Real Watercolor palettes give you further options for controlling canvas texture. The Smart Blur effect lets you quickly apply a painterly effect to an image. By smoothing out colors and sharp details, the Smart Blur effect softens the appearance of an image with a result that is similar to applying soft brushstrokes. Change settings, such as brush size, opacity, squeeze and angle, using interactive controls that let you make rapid adjustments from one centralized location. Scalable resizing lets you preserve correct brush proportions. Use shortcuts to access brush settings even faster! Find the right brush quicker and easier than ever! The brush categories have been consolidated into families and sub-families, giving you a clear path to finding the perfect brush. Blend brushstrokes better than ever with dynamic settings. New controls let you set the merge mode and opacity for each brushstroke, resulting in much smoother blending. This feature, combined with new airbrush variants, will especially appeal to Photoshop users. With six new Digital airbrushes, Painter 12 helps you achieve stunning airbrush effects. These new airbrushes produce effects similar to blend modes in Photoshop and work in concert with the new Computed Circular brush controls. The controls let you determine how brushstrokes interact with each layer of the canvas by adjusting opacity and hardness. With the new Computed Circular brush control panel, you can specify the opacity and hardness of your brush. The new Gel brushes let you tint an image\’s underlying color with the color of the brushstroke color. Customize Gel brushes by using the new Merge Mode brush controls on the General brush control panel. Multicore brush support maximizes brush performance when working on a multicore computer. Welcome to comfort! An interface refresh streamlines brush selection, image navigation, libraries, color controls and image set up to make the workspace more intuitive and quicker to navigate—changes that will especially appeal to people familiar with the Adobe® Photoshop® environment. This streamlined approach will significantly reduce the learning curve for new users. Customize Painter to remember your touch. Brush tracking is an amazing feature that lets you instantly program Painter to remember your preferred brush speed and pressure sensitivity for each individual brush! Just as one size does not fit all, one speed does not suit all. Be particular with Painter! New to Painter 12, we\’ve introduced some custom workspaces to help artists from all backgrounds quickly familiarize themselves with Painter. Navigating your canvas and working with large images just got easier. Use the Preview window to drag and change your focal point on the canvas—perfect for moving to a different area of the image without having to switch tools or adjust the zoom level. The Navigator panel also gives you quick access to various tools, such as drawing modes, Impasto layer, Tracing Paper, grids and color management. You can now create custom presets, such as canvases, colors and paper textures, for your artwork. The New Image dialog box lets you give your image a title and choose canvas dimensions, resolution, color and paper texture before you start painting or drawing. With Painter 12, you can rearrange panels and palettes to suit your workflow. Group task-related panels together on a palette, snap panels and palettes to the edge of the application window, or leave them floating in the workspace for easy access. A handy addition, the new Color Changer palette pops up on screen for a quick, easy way to change your brush color. The palette only sticks around for as long as you need it, keeping your workspace clean. Tailor Painter to your liking. Create custom palettes for special projects and workflows you use frequently. Once you create a custom palette, it is saved from session to session for convenient and immediate access. There are no limits to the number you can create! Switch between different Transform modes from one centralized tool, and choose whether to transform the complete contents of a layer, or selected content, for greater speed, flexibility and precision. Painter comes with a broad array of pre-installed paper textures and brushes, such as watercolor media, acrylic paint, oil, pastel, chalk, pencil, marker and more. Choose an existing brush or create your own on the spot to produce unique brushstrokes! Get the best view! When zoomed in at more than 100%, the High-Quality Display option smoothes the edges of your image, allowing you to view it as it will print for a clear idea of the end result. Divine Proportion and the Rule of Thirds and Fifths guide help you visually arrange your canvas before sketching or painting to create perfect compositions. Create art like your favorite muses! The Underpainting palette includes color schemes based on various artistic styles, such as Impressionist, Classical, Modern, Watercolor, Sketchbook and Chalk Drawing. You can also match your Underpainting palette to that of any open image for consistency. Match the color and intensity between two images. Just open an image that features your desired color scheme and use the Match Palette effect to bring that color to the image you want to change. Speed—Painter 12 is 5x faster! Ready, set, go! Brush performance is 3 to 5 times faster, while a range of Painter tasks, such as opening files and flattening, flipping or blurring images is up to 3 times faster than Painter 11. Expand your possibilities! Painter is a powerful addition to your existing digital art software, providing a high-performance brush engine and the most realistic digital painting tools in an environment that so closely reproduces the look, feel and results of traditional art, you may forget you\’re using software! With Photoshop support, you can correctly preserve colors and layers when transferring files between Photoshop and Painter. Plus, the Painter 12 workspace offers brush blending, layers, libraries, docking panels, shortcuts and image set-up options that will help Photoshop users feel right at home. Support for the entire Wacom product line, including Cintiq® interactive pen displays and Intuos® pen tablets, gives you the most responsive digital painting software and the best digital art experience. Enjoy exceptional freedom of movement and comfort as you paint in the most natural way possible. 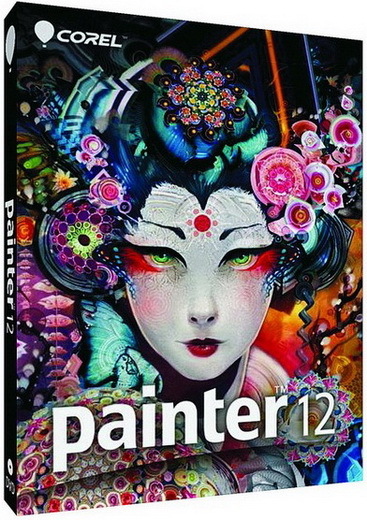 Painter 12 supports a variety of industry-standard file formats, including Portable Network Graphics (PNG), Adobe® Photoshop® (PSD), TIFF (CMYK & RGB), Windows® Bitmap (BMP), PC Paintbrush (PCX), TARGA® (TGA), GIF, JPEG, QuickTime® (MOV), Video for Windows (AVI) and Corel Painter Frame stacks (FRM). Also save files in Encapsulated PostScript® (EPS) format.